Want to know about the GLUE trick? Yes, using a glue you can create and remove your mani easily. Sounds odd? Now, here's a useful trick I learned on how to use your glue in creating and removing your manicure easily. This will help you create perfect shape for your nail polish without a mess. This is odd but amazingly helpful. You will not know until you try. 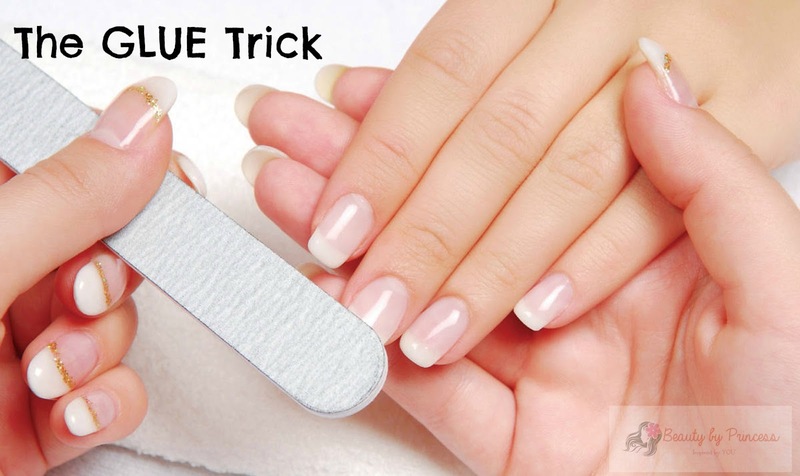 In this trick you have to apply glue on the sides of nail beds (be careful not to touch the nail beds itself). Then, wait until the glue dries. Next thing, apply your favorite nail polish now. You will notice as you apply on the little details on the sides of the nails where you put your glue the nail polish will not stick that is why it gives you a perfect shape mani. Good for those who just can't perfect their mani without a paint on the edge like me. Another GLUE trick I found if you want no hassle in removing your nail polish here's the trick: apply glue as a base coat for your nail polish, wait for it to dry and do your manicure as usual and if you want to change your mani you can peel it off anytime. Easy peasy! I've been doing my own mani and at least it is helpful to know about this. This makes my work easier. How about you, have you tried this on your nails? I hope it helped you as much it helps me.